A review of an article by Armina Omerika, newest member of Germany's Islam Conference. Looking for a silver lining, this time in the Mideast. Looking for a silver lining to ObamaCare. Another push on health care may drive Tea Partiers to embrace the Republicans. The Obama administration will have to change the way it works if it is to 'pivot' to reduce deficits, etc. A checklist, co-authored with Libby Sternberg, of points President Obama is likely to make as he argues for health care reform. My misgivings about how the Democratic leadership is handling the health care debate. Some unfavorable comparisons that occurred to me while reading The Forgotten Man by Amity Shlaes. Voters, if they choose Obama for president, will not get the results they clearly want for either the mortgage crisis or offshore oil and gas drilling. Edited by Tony Joris. Report of a colloquium on the prospects for further cooperation between the European Union and the United States, October 2008. Atlantic Council of the United States Policy Paper, arguing that NATO and the EU must renew their commitment to a transatlantic partnership. February 2006. Interim Governments: Institutional Bridges to Peace and Democracy? 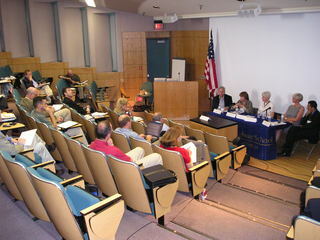 Report on a conference sponsored by the Navy International Program Office and the Department of National Security Affairs, Naval Postgraduate School, July 2005. Islamism has survived and spread in Bosnia-Herzegovina since the war ended in 1995. These three organizations struggle to control the future of Europe. Russian author Elena Chudinova imagines France's bleak future under Islam. Books by Wafa Sultan and Nonie Darwish argue that repression, cruelty and fear are central to Islam. Europe's deficient response to the challenge posed by radical Islam. Events in Iran today are reminiscent of events in Poland when Solidarity was established. Former senior Justice Department official Mark Richard and I examine the difficulties in sharing information between the United States and the European Union to combat terrorism and serious organized crime. A review essay of Christopher Deliso's The Coming Balkan Caliphate: The Threat of Radical Islam to Europe and the West, and John R. Schindler's Unholy Terror: Bosnia, Al-Qa'ida, and the Rise of Global Jihad. The U.S. Congress needs to pass the Free Speech Protection Act to uphold First Amendment rights of American authors, particularly those writing on such issues as terrorist finance. A review of Algerian author Boualem Sansal's Le Village de l'Allemand: ou le journal des freres Schiller, France's novel of the moment that links Islamism to Nazism. Post-Bush improvements in transatlantic relations will be constrained by continuing differences in security threat assessments; the lingering effects of 'Bush-hatred'; and declining US interest in and knowledge of Europe, particularly the EU. This monograph argues that the United States needs a new strategy for dealing with the European Union, and the organizational changes to support it. Whether the EU becomes weaker or stronger, acts as partner or competitor, the United States cannot afford to ignore it. Germany must find its place along a continuum of EU and NATO security policies and military forces. EU counter-terrorism policy, including cooperation with the United States, was transformed after 9/11. A review of Friendly Fire: The Near-Death of the Transatlantic Alliance, by Elizabeth Pond; America Unbound: The Bush Revolution in Foreign Policy, by Ivo H. Daalder and James M. Lindsay; and Allies at War: America, Europe and the Crisis over Iraq by Philip H. Gordon and Jeremy Shapiro. The Iraq dispute brings together underlying strategic tensions and growing transatlantic estrangement. How the United States should respond to the emerging EU defense and security role. Instead, deep divisions over terrorism and other threats will remain. The United States needs to make its case to European publics. Reconstruction in Iraq will be neither fast, easy or successful from the start. But neither was reconstruction of Germany after World War II.